Twice as I watched the Republican National Convention, (On television – since there was no room for “drop-in guests”) I saw prayer. I did some research and found the Democrats also had some prayer at their private party. I like prayer, I pray, praying is a good thing. But I couldn’t help but wonder ….. why? Do these politicians come asking God to do as HE pleases? Do they come seeking HIS will? or…. Is it like asking God to bless them so they can do as they please? Is it about asking God to put his approval on whatever they do… so we can call it “God’s will”? Is it about acknowledging God, creator and sustainer, or is it about creating a state religion that can sustain right of the powerful to rule? I just wonder? 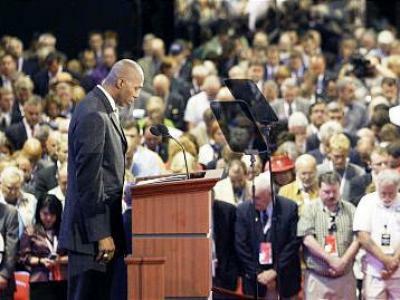 The opening prayer at the RNC was by a Mormon, Thurl Bailey, former NBA player with the Utah Jazz. Four years in a row, Mormons have opened or closed the RNC. Now I know the LDS church is not all too fond of evangelical Christians (except when it comes to sharing political power). I know the savior of the LDS is not the same savior we Christians worship. So if the object of our prayer is not of real importance …. can we expect a prayer at the RNC (or DNC) from Muslims, Jews, Hindus, or Buddhists as well? I have nothing against generic “prayer” in a corporate setting, it has its place. But disciples of the Lord Jesus need to realize this type of prayer is not the same as real biblical prayer of believers. I do worry about prayer and God talk becoming so tied to the the “US of A” that it becomes a form of STATE WORSHIP that muddies the understanding of what real CHRIST WORSHIP is. Maybe we need to think about what we are doing and why we are doing it? Just for closers – here is Donald Miller (someone I respect as a speaker and writer) closing the DNC in prayer this year.